"I think I could sleep again if there was somebody next to me, you know, someone nice." Netflix has just debuted a new full-length trailer for Ritesh Batra's film Our Souls at Night, a romantic drama starring Robert Redford and Jane Fonda, who have appeared together four times in films, starting with Barefoot in the Park over fifty years ago. The story is about two older people who are neighbors in a small town in Colorado, but had little contact. They finally connect and romance sparks, as they try to make the most of the rest of their time. In addition to Redford and Fonda, this stars Bruce Dern, Matthias Schoenaerts, Judy Greer and Iain Armitage. This film is as sweet as grandma's apple pie, and very charming, but is very lightweight and doesn't offer much below the surface. At least it's adorable to see them together again. 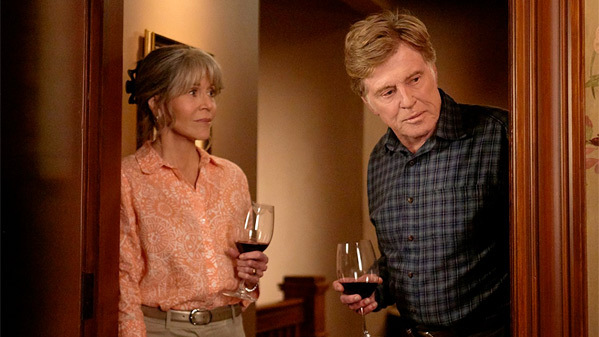 Our Souls at Night is set in Colorado and begins when Addie Moore (Jane Fonda) pays an unexpected visit to a neighbor, Louis Waters (Robert Redford). Her husband died years ago, as did his wife, and in such a small town they’d been neighbors for decades, but had little contact. Their children live far away and they are all alone in their big houses. She seeks to establish a connection, and make the most of the rest of the time they have. Our Souls at Night is directed by Indian filmmaker Ritesh Batra, of The Lunchbox and this year's The Sense of an Ending previously. The screenplay is written by Scott Neustadter and Michael H. Weber, based on the best-selling novel by Kent Haruf. This will premiere at the Venice Film Festival first. Netflix will release Batra's Our Souls at Night in select theaters + streaming starting on September 29th.